FORT WAYNE, Ind. -- For the eighth time in the last nine years, the TinCaps are one of the top 25 best-selling brands in all of Minor League Baseball (160 teams), MiLB announced Monday. 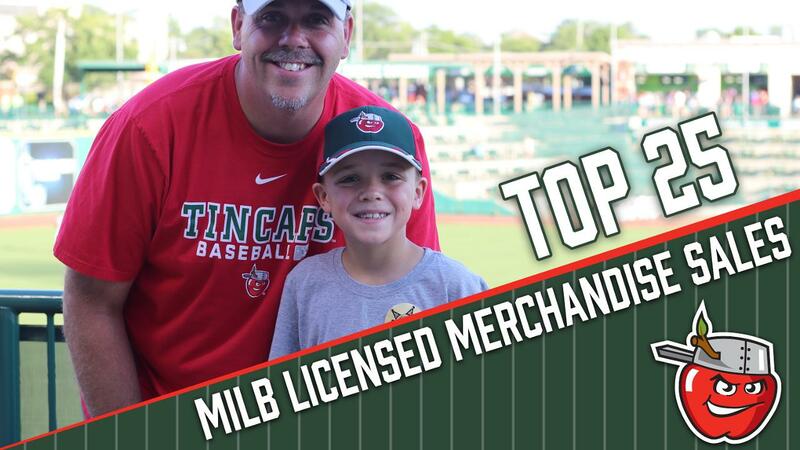 The TinCaps were one of just two Midwest League teams to make the top 25 for licensed merchandise sales in 2017. The list is made up of 16 Triple-A teams, six Double-A clubs, and three Single-A squads. "The TinCaps logo is recognizable not just in Fort Wayne but with people from out of state, too," TinCaps Merchandise Manager Jen Klinker said. "I think having a unique logo and brand is why we continue to be successful in selling our merchandise." The Orchard Team Store sells merchandise all over. In 2017, the team store made sales to 43 different states, plus other countries. "It's a credit to the experience at Parkview Field," President Mike Nutter said. "Fans enjoy their time at the ballpark and want to have something to keep with them, whether that's a jersey, a hat or another item in the store. Jen and her crew also do a great job of making sure we're stocked with items that are fashionable and practical." In 2017, Minor League Baseball's 160 teams combined to set a record with more than $70.8 million in retail sales, which marks a 3.6 percent increase from 2016. Alphabetically, the other top 25 teams are: the Albuquerque Isotopes, Buffalo Bisons, Charlotte Knights, Columbia Fireflies, Columbus Clippers, Durham Bulls, El Paso Chihuahuas, Frisco RoughRiders, Harford Yard Goats, Indianapolis Indians, Jacksonville Jumbo Shrimp, Lehigh Valley IronPigs, Nashville Sounds, New Orleans Baby Cakes, Omaha Storm Chasers, Portland SeaDogs, Reading Fightin Phils, Rochester Red Wings, Sacramento River Cats, Salt Lake Bees, South Bend Cubs, Tacoma Rainiers, Toledo Mud Hens, and Trenton Thunder. The Orchard Team Store is open year-round at Parkview Field, Monday-Friday from 10 a.m. to 5 p.m., as well as on game days. TinCaps merchandise is also sold online at TinCaps.com. In November and December, the team also opens a satellite store at Glenbrook Square Mall. In their 10th season, the TinCaps have introduced new jerseys and logo marks this year. Brand new gear is currently available for purchase.